Matthew and I are profoundly deaf and genetically on paper we were aware there was a 50/50 chance of having a hearing impaired child (Matthew comes from a family of five deaf generations, I have hearing parents, one hearing sister and one deaf sister). Throughout my pregnancy we were so sure our baby was hearing when I dropped a plate and he moved in my tummy! In June 2013, I gave birth to Brody at Whipps Cross Hospital, Waltham Forest in a water pool and the very next day he failed his first hearing test which is normal for most babies born in water. Afterwards, we were told that there’s a special machine which bypasses the water in the ears. An appointment will be made for Brody to have this in one week or so, but then it was done immediately 30 minutes after the first hearing test. She came back and put sticky electrodes on Brody’s face and head. He was furious! It was a 20 minutes test and we stopped after 5 minutes. We felt it was very intrusive. Brody failed his second test then the third test which was four hours long at Wood Street Health Centre with the audiologist who we couldn’t lip-read. We started to lose patience but Brody slept peacefully through it all. We were told that Brody had a mild to moderate hearing loss. We were very confused and expected a very straightforward answer which was – profoundly deaf or severely deaf. We left quickly and looked up on the Internet and were surprised to see mild to moderate hearing loss does exist. We knew there was varying degrees of hearing loss but wasn’t aware that it was called “mild to moderate”. Living in the Redbridge borough of East London, using Waltham Forest & Redbridge council services, we were given support straight away after Brody was diagnosed hard of hearing. Suddenly we had access to everything we did not know about before he was born: Coffee mornings at Early Years Centre EaST 17 in Walthamstow, Roding School in Roding Valley with Parent Workers, and other parents with deaf children. Brody got his own Teacher of the Deaf with her monthly visits. She even helped out with his nursery by teaching the staff deaf awareness and answering all of our questions! He has been to speech therapist twice at Redbridge Children’s Speech & Language Therapy Service and an interpreter was provided both times. 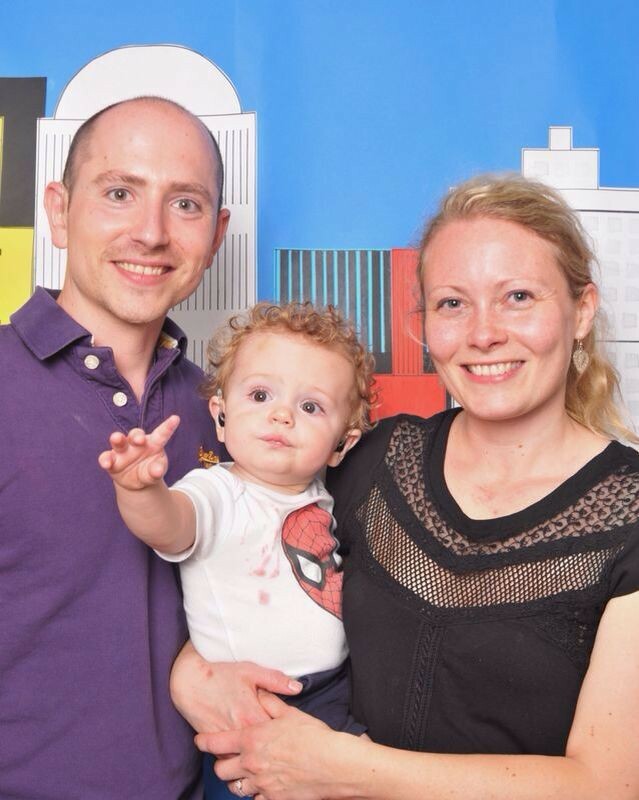 Audiology appointments were at Whipps Cross University Hospital Audiology Service Hearing Assessment Centre where he had his hearing aids fitted at 4 months old with cool red ear moulds! The tests showed he responded much better to sounds with his hearing aids than without. We felt really lucky with the rich resources out there available for our child. Overall, I found the speech therapy appointments the hardest because of the language development and skills that are required at his age. Brody is very vocal but I can’t make out what vowel and sound he is making, but at home we make sure we teach him all sounds like music, animal noises and buy musical toys. Brody likes to create sounds by himself by banging the saucepans! With our own mixed experiences growing up deaf, we want the best for Brody and we make sure we use our voices and BSL with him since he was a baby; he has turned out to be a very attentive happy little fella. Without all the support we are receiving for Brody, especially his Teacher of the Deaf (she’s a godsend! ), we would definitely struggle with how to go forward with Brody’s deafness and for him to fit in with society, to make sure he is treated as an equal with his hearing peers and not to be isolated. We believe this won’t be the case because we are confident Brody’s interests are being cared for. We feel the future is bright for Brody who is 13 months old as there are hearing members of his maternal family, whilst also having Deaf members of his family to guide him through his life. We feel reassured that the outcome of this environment means he will have the best of both worlds. Knowing NDCS is out there challenging cuts to deaf children’s services like Teacher of the Deaf support, to ensure families like ours get the best services they can is great. Please join us as members of the Campaigns Network today to ensure every deaf child receives the support they need. This entry was posted in Audiology, England, Health, Uncategorized and tagged BSL, deaf, Deaf Children, deaf parents, Education, Hearing Aids, hearing test, Teacher of the Deaf. Bookmark the permalink. Wow, what an exciting time! Seems like you’re really got your hands full with this one! I bet you’re thrilled that your child has some hearing, but I bet it’s got to be tough trying to make sure he learns to speak when you can’t hear him. Good to hear that you’ve got some great help! I find this article helpful as it contains wonderful stage close to web design in 2015. Take into account these retirement quotes as options for some phrasing and sayings you can include in a retirement card or greeting.